I am breaking bread with a wonderful lady today — who happens to be my favorite neighbor. For those who don’t know, my house has been for sale. Knowing that I will miss my neighborhood and especially Ms. C, I decided to make this hearty and tasty Kale Pasta Salad — as I way to thank her for always being so kind and helpful. 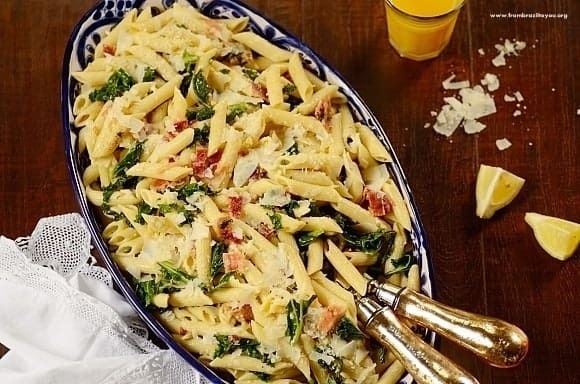 … and then preparing all the ingredients to assemble our dish such boiling the pasta, mincing the garlic, slicing the lemon, and chopping both the bacon and kale. This kale pasta salad is a simple yet versatile dish that can be served either cold or warm, as a side or main pasta dish, all year round. Although kale is a cold crop, it’s available the entire year in the US. 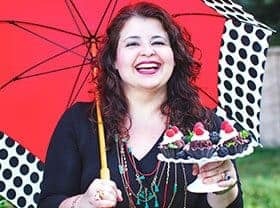 Our dish can be easily adapted to fit a vegetarian diet by simply omitting bacon from the recipe… and was inspired in one of my favorite Brazilian leafy dishes, Couve à Mineira. To bring its flavor, I just had to cook the kale in medium-high heat until slightly wilted — softening its bitterness. I could not be more pleased… the kale pasta salad turned out fantastic combining different textures and also flavors (salty, garlicky, smoky, and mildly bitter). For other delicious pasta dishes, check out Barilla®​ recipes… and enjoy our refreshing kale pasta salad! Kale Pasta Salad is a quick and tasty dish that can be served either cold or warm, as a main or side dish, all year round! 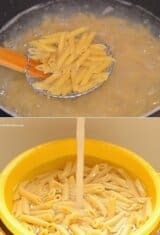 Cook pasta in salty boiling water for about 12 minutes. Drain, rinse with cold water, and add to a large bowl. Set aside. 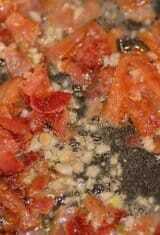 In a large skillet or pan, heat 4 tablespoons of oil and add the minced garlic. Cook over low heat, stirring occasionally, for about 2 minutes. Don't let garlic turn brown! 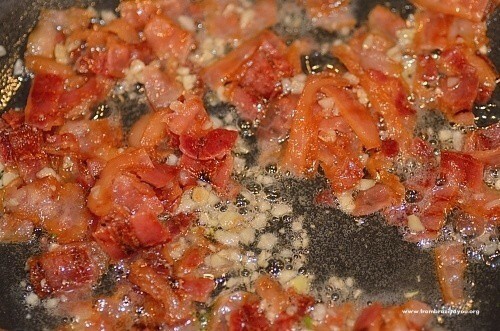 Add the cooked bacon and heat for about 1 to 2 minutes to bring out its flavor. Remove pan from heat, stir in 3/4 teaspoon of salt and 3/4 teaspoon of pepper. Pour mixture all over the cooked pasta, tossing well to combine. Set aside. 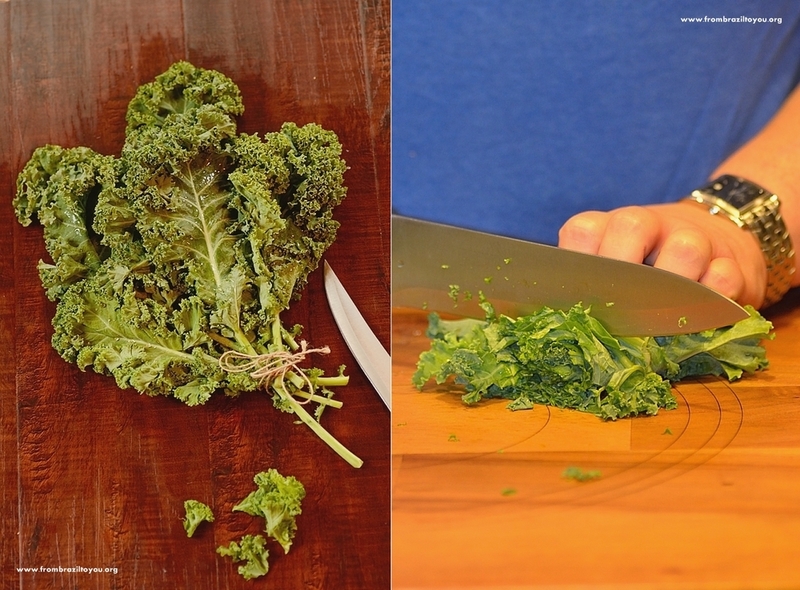 Add the other 2 remaining tablespoons of oil and chopped kale to the same skillet or pan (without wiping it out) and let cook over medium-high heat for about 3 to 5 minutes or until kale is slightly wilted. Warming up the kale over medium-high heat brings out its flavor, avoiding get too bitter. 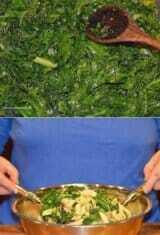 Add kale to the pasta mixture with the lemon juice, and toss to combine. Let sit for about 5 to 7 minutes. When mixture has cool down, add the Parmesan cheese and toss. Taste pasta mixture, adjusting the seasonings if necessary. Chill kale pasta salad for about 2 to 3 hours (or more if necessary) and serve. 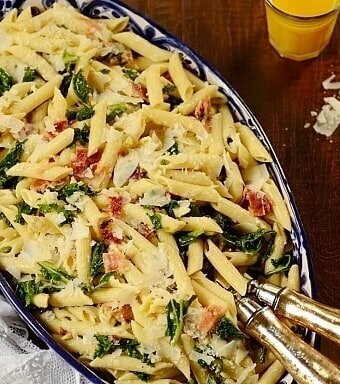 This kale pasta salad can be served warm if desired. In this case, place the Parmesan cheese on top just right before serving. P.S. : To find out about the health benefits of kale, click here.